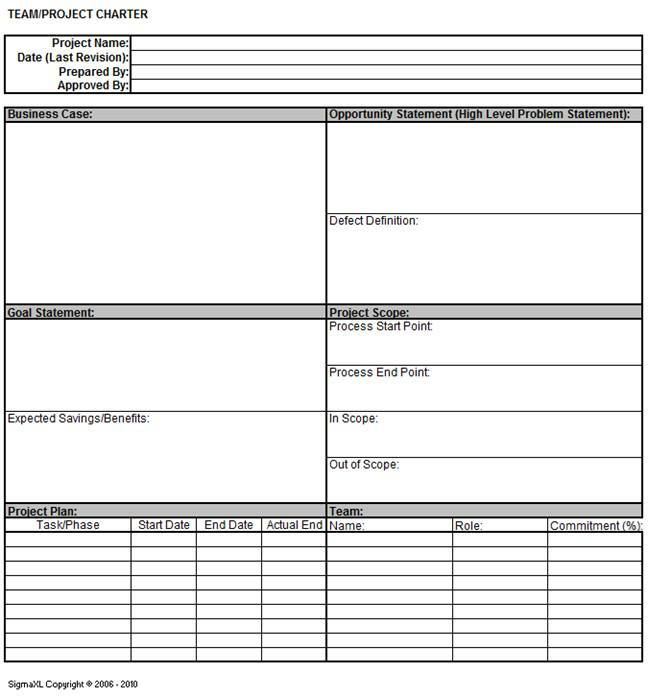 Click SigmaXL > Templates & Calculators > DMAIC & DFSS Templates > Team/Project Charter to access the Team/Project Charter template. Click SigmaXL > Templates & Calculators > DMAIC & DFSS Templates > SIPOC Diagram to access the SIPOC Diagram template. Click SigmaXL > Templates & Calculators > DMAIC & DFSS Templates > Data Measurement Plan to access the Data Measurement Plan template. 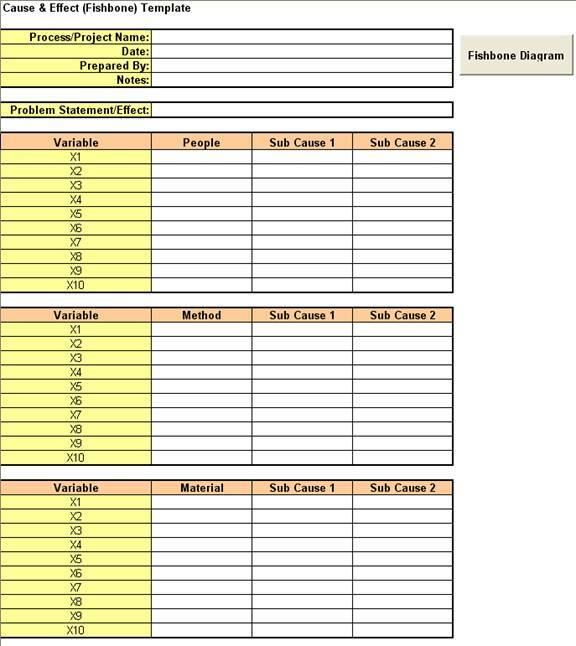 Click SigmaXL > Templates & Calculators > DMAIC & DFSS Templates > Cause & Effect (Fishbone) Diagram to access the Cause & Effect Diagram form. Overwrite the text in the Cause, Sub-Cause and Problem Statement/Effect as appropriate. Use copy and paste to create additional causes or sub-causes. The arrows with text are grouped. To ungroup use Excel's Draw > Ungroup tool. 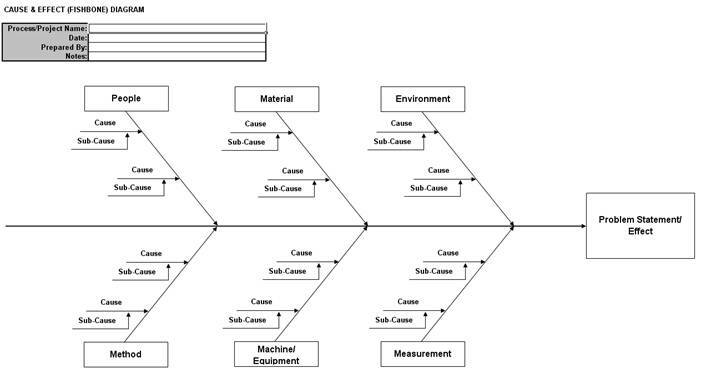 Click SigmaXL > Templates & Calculators > DMAIC & DFSS Templates > Cause & Effect (Fishbone) Template to access the Cause & Effect Diagram template. Click SigmaXL > Templates & Calculators > DMAIC & DFSS Templates > Cause & Effect (XY) Matrix to access the Cause & Effect (XY) Matrix template. This is a simple Cause and Effect Matrix example for a Call Center. If prompted, please ensure that macros are enabled in order to allow Pareto Charts to be created. Weight the Output Variables (Y's) on a scale of 1 to 10 with 10 indicating most important to the Customer. For Root Cause Analysis, assign the association/effect multiplier score for each X to Y using a scale of 0, 1, 3, 9, where 0 = None, 1 = Weak, 3 = Moderate, and 9 = Strong. Initially this assignment will likely be a team subjective assessment. Data should be collected and the degree of association should be validated with Graphical and Statistical Tools. For Project Selection or Solution Selection, assign the association multiplier score for each X to Y using a scale of 1 to 10, with 10 indicating strong association. Click the Pareto Chart button to create a Pareto Chart of Weighted Scores by Input/Process Variables. Click SigmaXL > Templates & Calculators > DMAIC & DFSS Templates > Failure Mode & Effects Analysis (FMEA) template. This is a simple Failure Mode and Effects example for Stocking Inventory. If prompted, please ensure that macros are enabled in order to allow sort by RPN. Click Risk Priority Number (RPN) Sort to sort the rows by RPN in descending order. Click Revised Risk Priority Number Sort to sort the rows by Revised RPN in descending order. 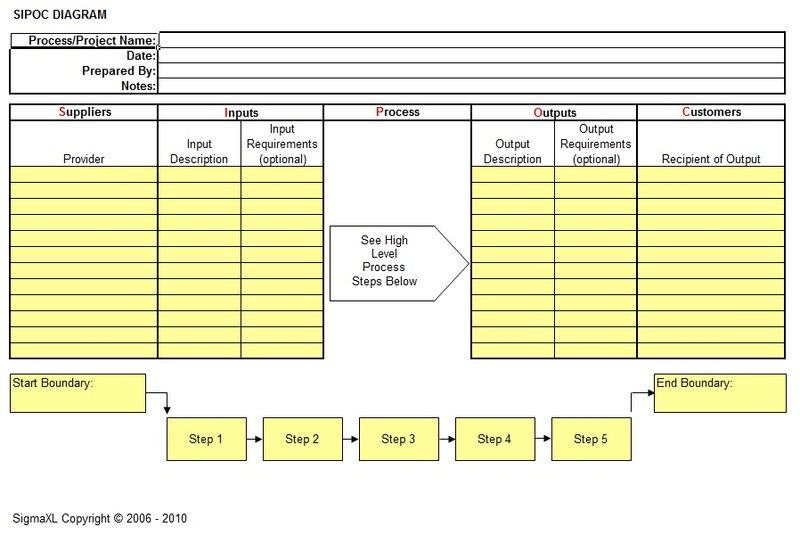 Click Row Number Sort to restore the FMEA worksheet to the original row order (ascending). 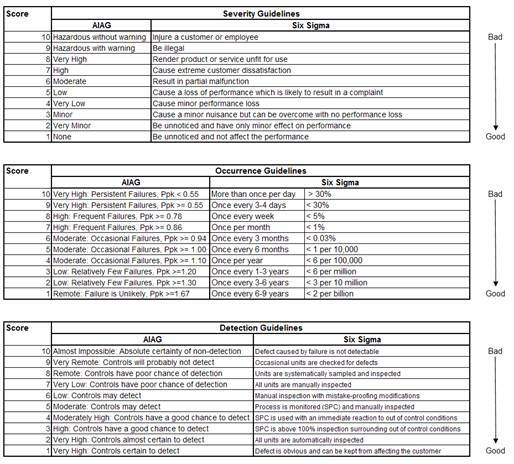 Click SigmaXL > Templates & Calculators > DMAIC & DFSS Templates > Quality Function Deployment (QFD) > 10 by 10 QFD (or 20 by 20, 30 by 30) to access the Quality Function Deployment (QFD) template. Enter data as shown. 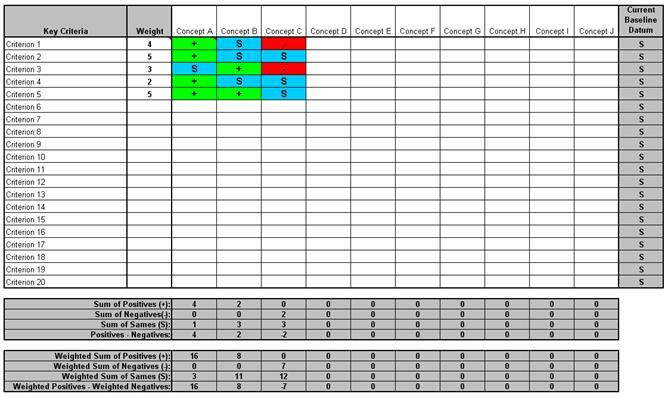 Click SigmaXL > Templates & Calculators > DMAIC & DFSS Templates > Pugh Concept Selection Matrix to access the Pugh Concept Selection Matrix template. Enter data as shown. Click SigmaXL > Templates & Calculators > DMAIC & DFSS Templates > Control Plan to access the Control Plan template.